Once you decide on what you want to build for your outdoor living enjoyment, the next round of decisions you need to make are material selection decisions. Choosing whether to use wood or composite for your decking boards is not a simple decision. Both wood and composite have pro’s and con’s. Simply stated, composite will perform better and cost more. Wood still performs well but certainly not as well as composite. Wood costs significantly less. Here are 5 questions to ask yourself to aid you in your decision. 1) How long are you going to be in your home? If you are planning on being in your home for another 10 or 20 years, then a composite wood warranty will still be in effect. Composites cost more but most carry a 20 or 25 year warranty that protects against things like blistering, peeling, flaking, cracking, splitting, cupping, rotting, and decay from bugs or fungus. Each warranty is different but these are the sorts of protections that will be covered in composite warranties. Natural wood may have no warranty or a limited lifetime warranty. But, this does not mean that a wood deck will suffer from all the maladies covered by a composite warranty. Wood decks can still last 15 or 20 years and still look good if properly maintained. Because composites are low maintenance, carry such a long warranty, and will look the same in 10 years as it does today, composite is a good investment if it makes sense for your budget. 2) How do you feel about painting, staining and sealing? Do you get crabby just thinking about staining, painting and sealing? Or, does the annual deck maintenance fall into the category of just another outdoor task for each summer? I’ve found that people generally either don’t mind this at all or or simply won’t invest in materials that require annual maintenance. In order for wood to look good from year to year, it will require annual maintenance. In addition, this annual maintenance will have a cost that includes material and possibly labor if you choose to have someone do this for you. 3) How authentic do you want your decking to look? Nothing looks more like wood than wood itself. Composites have come a long way and they’re looking better all the time. They are adding more streaking and ridges but this is one category where they will be forever be chasing the real thing – natural wood. 4) What sort of wear and tear do you expect your deck to have? Some wear and tear will come directly from the environment with the sun being the biggest offender in this category. Other wear and tear issues are general use and moving objects around on the deck such as chairs and tables. A composite deck will resist wear, tear and environmental degrade better than wood. 5) Do you prefer to pay more now and less over time or less now and more over time? Regardless of all of the features and benefits of composite, it has to make sense for your budget. 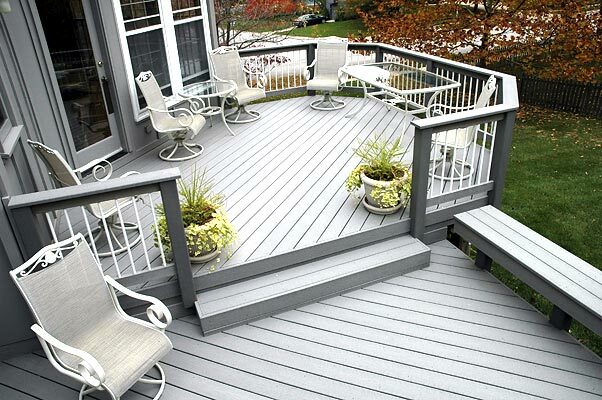 A well-maintained wood deck can last a good 15-20 years or longer however wood will wear and tear over time. Wood will having some cracking and splintering and other wear and tear issues as time goes on. The bottom line is the only right decision is the one that’s right for you. Based on your answers to the above questions, you should have a good sense whether wood or composite are the best material selection for your new deck. This entry was posted in AZEK, Composite decking, Composite decks, Composite woods, EverGrain, Fiberon, TimberTech, Trex, Wood vs. composite and tagged Archadeck KC, Archadeck of Kansas City, Kansas City decks, wood vs. composite on March 27, 2012 by archadeckkansascity.